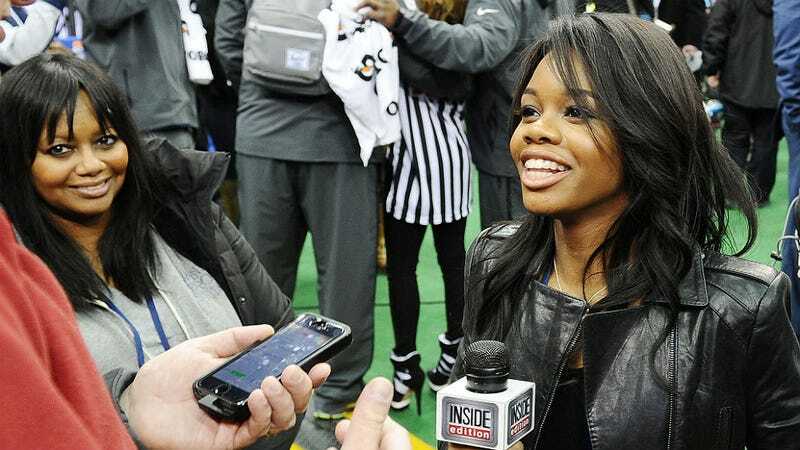 On Saturday night, Olympic gold medalist Gabby Douglas will get the cheesy Lifetime movie treatment with The Gabby Douglas Story. The trailer just hit this Internet and while it looks camp, I’m excited to see Imani Hakim from Everybody Hates Chris in the lead role. Regina King and S. Epatha Merkerson are also in the film as Gabby’s mother and grandmother. The Douglas Story looks like the perfect family movie to watch with grandma — old ladies love Gabby — except some who have seen the made-for-TV film say the script leaves out one big piece, race. Douglas overcame a lot—that’s not up for debate. But she overcame quite a bit more that’s not in the movie. The most glaring omission from her story is seemingly the most obvious one: It’s impossible to ignore that Douglas is a black woman competing in a sport that is predominantly white. Even while Douglas was a favored presence at the games, her race was an issue of discussion, ranging from NBC’s botched coverage of her time in London to arguments about her hair. Douglas has not been silent on the issue, either. In a 2012 interview with Oprah Winfrey, Douglas explains she felt so isolated because of the racism she experienced at her original Virginia Beach gym, it was one of the reasons for her move to Iowa. Douglas’ ethnicity is reportedly mentioned at least once, when her mom drops her off with an Iowa host family so she can train with coach Liang Chow. It is then that Gabby realizes that she'll probably be the only chocolate drop at the gym. But outside of that scene, the idea that Gabby is a woman of color from a poor family in a predominantly caucasian sport, which has made a habit of ostracizing competitors of color, is odd. But I guess Lifetime wasn't trying to rile up grandma. Simone Biles Vs. The Racists: Are Black Gymnasts The New Black QBs?